Grilling pork chops on your Foreman Grill is easy and delicious. Pork chops are very versatile and can be prepared any number of ways with ease. We recommend using center-cut boneless chops, cut to 1/2″ to 3/4″ thick for your Foreman Grill, to produce optimal results. 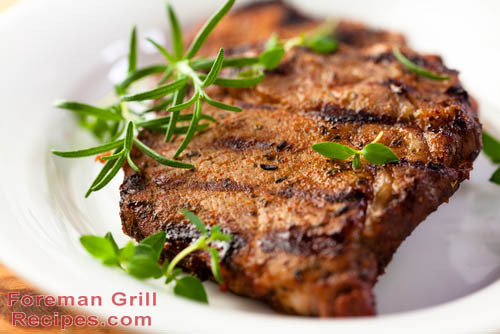 Preheating your Foreman Grill for preparing preparing pork chops is essential as it sears in the flavors. Brush pork chops with olive oil and season to taste with salt and pepper. Additional seasonings of your choice can be added at this point. Preheat your George Foreman Grill for at least 5 minutes on high. Grill pork chops for 6-8 minutes (internal temperature of 145 F cooked to medium). When done, they should be slightly pink in the center. Pork chops are complimented well with side dishes of rice and fresh vegetables. I also ‘carefully’ slot the thicker chops for stuffing and slice green onions lengthwise and place them into the slot before grilling. If you cut off the longer green portion, you can chop them up you can add them in a salad to go with them or into a baked potato with butter and sour cream. I just love a bite of pork chop with a bite of green onion at the same time. If you marinate those chops with a little blend of Worchester sauce, red wine over night in the fridge, and lightly sprinkle on some chopped or ground thyme when ready to grill. This makes it tastier, more tender and more moist to eat. Agreeing with Bret, I don’t think you need to use kosher salt unless you’ve got a rabbi to bless your pork, too. Hilarious. On the other note, I can’t wait to make this for my kids. ….sea salt and kosher salt are close to the same thing. It’s not literally “kosher” salt, it’s “koshering” salt anyway. Good grief guys, educate yourselves before you make yourselves look like idiots. They already did a good job of that! I about choked on my water when I was reading their comments…lol! cmon hodor, it looks funny, kosher salt on pork chops… hehe…… lighten up man! Haha I was think the same thing but you put it first!!!! Kosher salt is used by cooks because of its texture, not because it is specifically kosher friendly. I cooked this last night & it was really good! Brent will no doubt have a seizure when I mention I’m going to use Pink Himalayan salt with black pepper and garlic flakes then. You all are too funny. Very easy recipe to follow. Used kosher salt !! lol Pork chops came out very tender. Last ones I sauteed in a cast iron pan were too tough. I will go back to this method. Thank you! Kosher salt is used by chefs because of the grain size. Kosher dill pickles have nothing to do with the salt, it’s the copious amounts of garlic used in making them. The name “Kosher dill” comes from the large amount of Jewish delis in New York, and their traditional recipe calls for lots of garlic. There are plenty of dill pickle recipes that do not call for garlic. OK folks…I’ve used this recipe all my life and it is always wonderful and a bit different from other pork chop recipes. And, it’s EASY. All you do is use one of those oblong baking pans…spray pan with a bit of olive oil. Put a pan-full of pork chops in the pan. Put salt, pepper and whatever other flavoring you like on the chops. Then, pour milk (yes, milk) over the pork chops until they are covered. Put in a 350 oven and let them stay there until the milk is absorbed. That’s it. It’s an old Southern recipe..which has stood the test of time. I’m guessing just until the milk absorbs like she states it would probably take at least 15-20 minutes that just taking a rough guess. I’m looking for different recipies to cook my pork. How about we not argue about kosher salt and just comment on some recipies u all have tried and liked. Thanks!! I love using RiceVinegar, Soy Sauce, Worcestar Sauce, fresh garlic and Red Pepper Jelly. This marinade is really good! Its great on grilled items…but also delicious if you sear meat on all sides…..then cook it in the oven with sliced onions. Yummmy!